In India, prayer and spiritual chanting is done on a rosary of Rudraksha by many people and Rudraksha bead is believed to be the tear drop of Lord Shiva, the destroyer of sins. The dedicated ones believe that Rudraksha grants them boons as it has been used since time unknown in assisting the sadhus, yogis, monks, swamis and also householders in their spiritual uplifting and ascension. It is the devotee’s strong belief that the more ‘naam japa’ or repeated chanting we do on Rudraksha mala, the more our past sins get washed away. As for me, I believe it to be true as some trees are granted special powers by Nature and are divinely gifted to help mankind take leaps in their spiritual evolution. From time immemorial, the Rudraksha tree is held sacred by the believers especially by the devotees of Lord Shiva in India and this very special tree grows in the foothills of the Himalayan forests and other neighbouring Asian countries. I can speak for its unique healing, therapeutic as well as peace giving abilities and qualities as I have had the splendid opportunity of not just getting to see the Rudraksha tree in Haridwar, but I also had the good fortune of breathing under the shade of its foliage by sitting at the feet of this sacred tree. I remember feeling so fresh and alive as I sat for a while there. Even until today, whenever I revisit the site mentally, I get the same celestial feelings. Just a few days back, on 10th Dec, after I rose from my morning meditation, I thought of relaxing for some time. So I went and sat on a settee which is placed just below the photo of my Param Guru, Shri Mahavatar Babaji and I shut my eyes. Many a times I come here to sit, thinking to myself that I am sitting at the Holy feet of the great Master, the Immortal Guru, and the giver of Light to this world. In this way, I pay my homage and acknowledgement and thank Him in my heart for his constant Grace and spiritual assistance that I keep receiving in so many unvoiced ways practically everyday. As my eyes closed effortlessly, I was disconnected from the exterior environment as I entered into a short phase of transcendental meditation unpremeditatedly. I slipped into an unspoken and indescribable peace which lingered for only a few short moments, but nevertheless made me qualitatively so enriched that the next few days were full of ananda or joy, enthusiasm and sharpened creativity. The joy and peace was heightened and so soul enriching during the super conscious state that I broke into a spell of invocation as I implored to God and asked to grant me a wish -That I should neither lose the smriti or memory of God which has been kindled and re- awakened after such a long time in the form of illumination and elucidation in me, nor should it fade away in this life. It should be etched indelibly in my consciousness. As I begged earnestly, the peace became more and more intensified and I further moved quietly into higher and higher realms of quietude or transcendental state. And then, all at once there was a complete silence within me as though the screen of my conscious mind was cleared and became vacant for something higher and bigger. I sat in that peerless state for a while when I saw with my inner eye a well spread Rudraksha tree and a rosary of Rudrakh beads. The tree was the same one that I saw in Haridwar some years ago incidentally. The tree drew a picture of being robust and healthy and the Rudraksha berries swinging on the branches were very soft, supple and pristine in their appearance. I saw myself sitting under this tree in a meditative pose in scattering bright light. The benevolent tree’s kind gesture was cascading over me in the form of its profuse foliage and swaying branches. And as I meditated under the tree a little longer, unalloyed peace and joy began to instill in me which left me in raptures of unknown ecstasy!! And the more ecstatic I got, the more I wished to stay in that state of elation. I was gently melting away like a weightless bubble in a fathomless sea and yearned earnestly to remain dissolved in that sea till unheard eternity!!! “Brahma or Spirit is thoughtless without a sankalp or a will of its own. While the individual soul or jeeva has its will or sankalp. When there is a wave of will in Brahma, it manifests itself as individual self or jeeva. The cosmic creation is born out of sankalp or will. So have a will to do good and very good karmas to rewrite your life. Those beings who are in a slumber lack the ability to will and do not exercise their right to will. There is enormous power in our will therefore use this power for performing good acts and fulfilling good purposes. God will be able to help you only when you initiate your will. 3) Highly meritorious actions or ati shubh karmas. When one performs meritorious or very meritorious actions, the past sins are washed away from the accumulated actions of many lives. The short cut to gateway of peace and heaven is through doing good and very good actions. Whenever a will to do harmful and detrimental karmas is aroused in you, immediately erase that will and in its place develop and substitute a strong will to do either good or very good actions. The tree further blessed me and everyone else copiously by saying that there is an original and causal power concealed in the mantra ‘Om Namah Shivaya’. If one chants this mantra reverentially as well as faithfully, he will soon find his path of salvation. Those who wish to have a Guru, will find a guru. If the person decides to meditate, sooner or later he will surely find his steps and methods of sadhana including specific meditation techniques. And if someone wishes to increase his power of will, he will achieve that too. Who so ever reads this write-up with belief and adoration will benefit in some or the other way. So in this way everyone will receive something or the other if he has faith and belief in all-pervading Spirit residing in us. 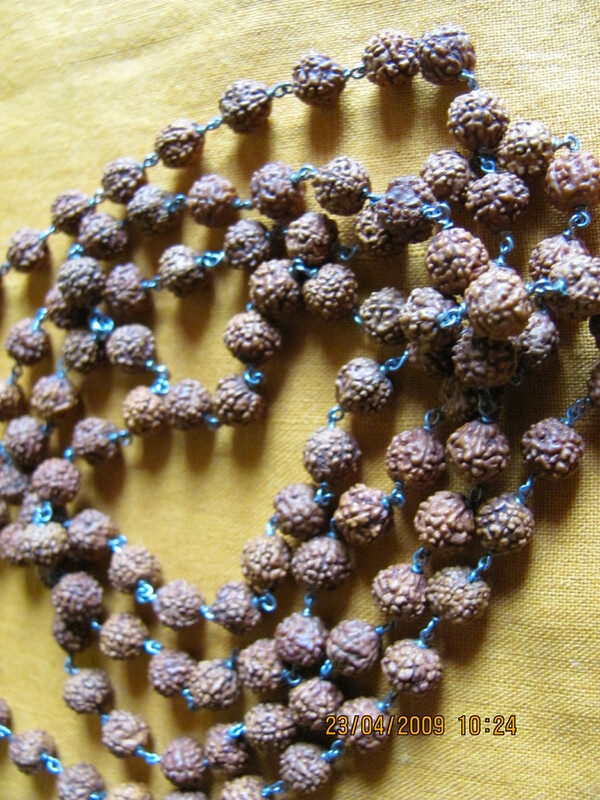 But those people who have hidden desires of greed and materialistic selfish goals will be disappointed because even though people follow different religions or paths, they must realize that the real purpose of rudraksha mala, or any rosary, crystals, beads or semi precious gems and stones is not for money or acquisitive purposes. They are meant merely as tools for empowering and assisting us in our activities of promoting and advancing spiritual efforts to make the path easier and smoother for Self realization”. So what is will? Will is the initiative power existing in us. The power to initiate, to start, to pursue and sustain and to accomplish something is called sankalp or will. Without the presence of will, we will not live well enough and will become lifeless, inert, lazy or ill defined in our direction. People who lack the power of will, do not perform well in carrying out their responsibilities and given roles. Our will is the deciding factor in humans which decides whether we wish to continue living or not. The best example in sight is of Bhishma Pitamaha in Mahabaharat who saw many generations and died only when he had the will to relinquish his body at long last. It is for the same explanation that a person does not become alright again when he is ailing because he wishes to live no further. And then there are small children and other individuals who are found alive under the debris but still manage to pull through after earthquake simply for the reason that they had a very strong will to live and so they survived the disaster. If the humans did not have a strong will nestling in them, this planet would not have witnessed resurrection of spirit, revival, reinvention, reconstruction and creativity in every possible form in spite of so much destruction, zonal wars, drastic climatic changes and natural calamities. The same will in man is resorted to when he decides to resurrect his lost divinity and glory. In practical life what should we do to increase this power of will existing in all of us? A few points are being mentioned below for the sake of the spiritual aspirants and others too. 1. Learn to listen more to people. They teach us a lot. Save energy. People around us keep us busy the whole day by talking to us needlessly. If you do not disconnect your mind and speech from them, you will receive their thoughts which will occupy and fill up your mental space. Their conversations mostly involves outmoded, repetitive or immature talk. Sometimes their mood is irritated or they are not at ease and they pass on their feelings to you. So just listen, be a passive listener. When we associate a lot with all types of people in a day, there is a possibility of absorbing their mediocre qualities or even demerits to say. Listen more, think more. Talk less, eat less. If you eat less, you will talk less.If you talk less, you will listen more. 2. Do not think negative thoughts. Believe in yourself completely. Whenever your mind thinks of impossibilities, tell yourself by affirming sincerely that it is very much possible for you to accomplish that task because you have the inborn power and the will of God with you. Positive thoughts give power to mind, body as well as the soul. Refrain from people who are pessimistic in their thoughts, attitude and outlook. 3. Choose the right things. Stop meandering. In most situations we have a choice so learn to listen to that voice which tells you what to do at that moment in time. At the start it may look easier said than done and you may be confused and unsure of yourself but with the kind blessings of the guiding Masters, the path will be cleared and clarity of mind will develop. Before long you agree that though the tasks looked daunting and challenging or even impossible before you set off, the decision that you took was correct. So do not be afraid of new life situations and undertake new ventures from time to time. 4. Attempt and perform extra ordinary deeds Think of those things which your subconscious mind denies you by making you believe imperfectly that you are not in the capacity to perform independently that particular activity, venture or enterprise. Do not listen to that shaky voice which disregards your inherent powers of all powerful Spirit. And once you accomplish that goal, your mind will become braver and stronger and the will power is going to be infused and heightened. What is the difference between Edmund Hillary who was one of the first known man to conquer the highest peak of Mt. Everest and an ordinary man? It is their will power. If you will something stoutly, you will accomplish it without any doubt. Therefore, stretch your limits to the point where you are totally involved with a new intimidating and overwhelming project after every few weeks or months and years!! Do not become complacent and satisfied. 5. Take proper, healthy nourishment and diet. Have nerves of steel but to have them you need to build them!. The nerves of the sadhak or an achiever cannot be made of less or inferior quality of building material because the sadhak pursues goals which are profound and unfathomable by layman. Our mind is a powerhouse and tremendous energy flows out from the brain in the act of willing to do something special or extraordinary. So eat those foods which will not only give nourishment to the frayed nerves but will also give strength and nourishment to them in rich supply. Some ayurvedic herbs like Shankhpushpi, Aswagandha, Brahmi are memory enhancers and rich in nutrients for regeneration and rejuvenation. Have regular supplies of good quality plant proteins, dairy products, walnuts, almonds, omega-3 fatty acids, antioxidants and vitamins found lavishly in vegetables, dry fruits and fresh fruits without skipping if you are storming your mind with robust will and simultaneously executing those ideals. Stress on quality rather than quantity of food. 6. Learn meditation. Learn and practice some kind of meditation technique to refresh, rejuvenate and consolidate the mind. A mind that meditates everyday has incredible amount of pranic force or life force and spiritual energies. The mind gets a great amount of rest and relaxation if we meditate daily. Energy in us which is saved by many ways is stored in the cells of the brain. So much of our energy is spent throughout the day through the five senses, specially senses of the mouth and the eyes. Speaking less contributes to a good amount of surplus energy. Over a period of time, a significant amount of energy is saved in this way and accumulated in the nervous system. And once after arousing the dormant primordial energy commonly referred to as Kundalini Shakti in India, all the stored energy in the brain and the area near the navel is utilized for breaking the ages long, deep, slumber of ignorance or avidya to stir up and awaken the Spirit in man!! Awakening of lost Divinity asks for a lot of determination, and self effort and it begins with the person’s own will. One must have a very strong urge and indomitable will to regain the kingdom of God and lost divinity through the secret and sacred knowledge of the Supreme. Unless you will it, you cannot achieve it! I published this post on 15-12-2009.I have explained this post in Pondicherry on 16-01-2019 at length. Since I returned from Pondicherry after concluding my discourse (13th to 19th January, 2019) I was intrigued by one thought. I wished to know the Spirit of this Rudraaksh tree which came to me many years ago and enlightened me. I was convinced that it must be a very pious Spirit since I know that all trees have a Spirit, this knowledge heightened my curiosity. “Brahma or Spirit is thoughtless without a sankalp or a will of its own. While the individual soul or jeeva has its will or sankalp. When there is a wave of will in Brahma, it manifests itself as individual self or jeeva. The cosmic creation is born out of sankalp or will. So have a will to do good and very good karmas to rewrite your life. I was not surprised because these important lines about Brahma could have come only from him. I was wondering and thinking since a long time who could it be? It must be a renowned and well established in Spirit enlightened person and to my most wonderful awakening, I found Agastya Maharishi in my meditation today. I have now found him so close to me since he has already been quietly guiding me since a long time ….My most humblest prostration to Him from my heart….. Updated on 26-02-19. On 17.1.19 we visited Parangipettai in a group. It is the birthplace of Shri Mahavatar Babaji. It is today protected by Agastya Maharishi. Spontaneously, I decided to grow Rudraksha trees in the holy precinct when I went there after five years. With God’s grace it became a reality and on 24-02-19 3 saplings of Rudraksha trees were planted. A post has been dedicated on Fb on 25-02-2019 of the same. Foods which promote longevity, intelligence, vigour, health, happiness and cheerfulness and which are sweet, bland, substantial and naturally agreeable are dear to the Saatvik type of men. Foods which are bitter, acidic, salty, over hot or spicy, pungent, dry and burning and which cause suffering, grief and sickness are dear to the Rajasik type of men. Food which is half cooked or half ripe, insipid, putrid, stale and polluted, and which is impure too, is dear to men of Tamasik disposition. We are going to discuss yogic diet for those people who want to lead a life of a yogi, the one whose mind is engaged with God. First of all, give up smoking and drinking because no mater how good the food is, alcohol and tobacco are going to bring down the quality of food and harm your system. Instead of drinking alcohol, do physical exercise which will digest the food, de-stress you and improve the overall health of the body and mind. Abstain from pork and beef preparations. They will make the mind slow in intelligence and agility. Food should be eaten consciously and not absentmindedly. Eating slowly and relishing every bite helps in digestion and assimilation. Reduce sugar, oil and salt intake to healthy proportions. For proteins, eat plant proteins instead of animal proteins and consume dairy products for Saativik or spiritual thoughts and mentality. Water, fibre, some raw food items like fruits, salad is essential in everyday food to aid digestion and elimination. Avoid artificial sweetening, colours, scents and flavouring as much as possible. And also food with preservatives should be avoided as far as possible. Instead consume foods in natural form and taste. Reduce and avoid eating sticky foods, particularly maida or baking flour and deep fried foods. Eat seasonal, locally grown foods according to age, activity, gender and temperament. Avoid situations of worries, stress and tension. For relaxation of mind and muscles, take massage therapy, do meditation of some kind, sing chants or devotional music and pursue other hobbies of your choice. Go for long walks for unwinding as well as de-stressing. Include all the parts of the plant in your food-starting from fruits, flowers, stems, leaves, roots and even seeds. All the parts of a plant should be incorporated in our food and diet. The food should be soft containing enough water content and palatable in taste. It should not emit smell that displeases our senses. The aroma of food should be appetizing and pleasing. Avoid very sour, very sweet, very hot, spicy and pungent foods. Consume natural sugar available in fresh fruits, vegetables and dry fruits. Eat foods of all colours like red, green, purple, yellow etc Eg. tomatoes, spinach, brinjal, corn, papaya, watermelon, bananas, grapes etc. Food should have nutrition for all the chakras or centres starting from mool aadhar chakra or root center to sahasrar chakra or crown chakra. Partake food and nutrition for physical, mental and spiritual activities. Our diet should be a complete package of food for relaxation, rejuvenation and restoration. Add micro nutrients and supplements as daily intake. The advanced yogis eat food which not only restores and preserves health but also for inducing anti- aging processes of mental and physical body. All the foods that have antioxidants are anti ageing. This reminds me that when I went for a pilgrimage in the Himalayas in the summer for Char Dham yatra, I had decided to trek throughout the whole trip instead of hiring a pony or take a helicopter. But the food that was supplied by the organizers was inappropriate and badly planned. Just before we were to start our long trek, we should have been given good quality proteins and carbohydrates instead of giving fried food items. The supposedly tasty fried food did not serve my purpose as I could not walk up on foot all the way up as a lot of energy was being spent on digesting the fried food. I trekked quite a bit but I could have trekked on all the routes provided the diet was right. Therefore, our diet should be right and we must have knowledge of food science and must be aware of what we eat and why we should eat a particular diet. Translation-Other yogis offer the act of exhalation into that of inhalation, even so other, the act of inhalation into that of exhalation. There are still others given to practice of Pranayam (breath control), who having regulated their diet and controlled the process of exhalation and inhalation both pour their vital airs themselves. All these have their sins consumed away by sacrifice and understand the meanings of sacrificial worship. This shloka is about performing sacrifices or yagyas with many things, one of them sacrificing the prana and indicates observing the incoming and outgoing breath through the scientific techniques developed by sages for regulating breathing. The word Pranayam is comprised of two Sanskrit words ‘prana’ plus ‘ayama’. Prana means life force, ayamam means extension or expansion. In totality, it means extending one’s life by extending the length of breath by breathing systematically by applying some breathing techniques for various aspects of respiration and mastering inhalation and exhalation. Pranayam utilises breathing to influence and increase the flow of prana or life force in the nadis or energy routes/channels of the energy body called pranamaya kosha, the life force sheath or body of a human being. The various techniques of Pranayam are the methods whereby the life force can be first activated and then regulated and expanded in order to go beyond one’s normal limitation and reach a higher state of awareness and vibratory energies. Prana is the force which exists in all animate and inanimate things. Pranayam is generally defined as breath control but it does not convey the full meaning. Therefore, it should not be understood or considered as mere breathing exercises aimed at supplying extra oxygen into the lungs. The different practices of Pranayam consists various techniques which involve the above stated aspects of breathing. However, at the higher stage of Pranayam which occurs during advanced stages of meditation, there is another mode of Pranayam which is called ‘Kevala Kumbhak’ or spontaneous breath retention. During this higher state, the fluctuation of prana ceases and breathing stops for some moments and simultaneously high level of awareness and complete oneness with Reality is attained. Body consciousness drops for those exclusive moments. There is complete stillness of mind and the life force used for breathing suspends. It is the precursor and beginning of experiencing Cosmic Consciousness. Although all five sheaths function together to form an integral whole, the practice of Pranayam deals mainly with pranamaya kosh. Most people breathe incorrectly using only a small part of their lung capacity, thereby depriving the body of oxygen and prana so essential for all the vital processes and activities of every cell. Prana is also extremely vital for the performance of our brain functioning. Pranayam corrects our posture to start with, introduces correct breathing habits, strengthens the muscles of the back and pulmonary cavity. It also establishes a regular breathing pattern, breaking the irregular breathing habits. Rhythmic, slow and deep breathing calms the mind and also endows longevity in humans because respiration is directly related to the heart. A slow, rhythmic rate makes the heart stronger and better nourished and healthier. Deep regular breathing increases the absorption of life force in Pranayam resulting in vigour and vitality and well being of the practitioner. Pranayam removes the blockages in the various nadis, the energy channels of life force thereby enabling increased absorption and retention of prana. As the sadhak or spiritual practitioner requires a calm state of mind the Pranayam techniques are very useful in this endeavour. Once the mind is stilled, the gateway to higher Cosmic Consciousness opens leading the seeker to higher states of awareness and evolution. Some types of Pranayams are:- Nadi Shodhana Pranayam, Bhastrika Pranayam, Kapalabati. A teacher’s guidance is essentially for its practice. ‘Asana Pranayama Mudra Bandha’ by Swami Satyananda Saraswati of Bihar School of Yoga. You are currently browsing the Spirit in life blog archives for December, 2009.